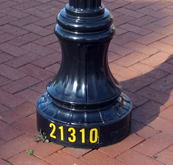 Lamp post and its pole number. 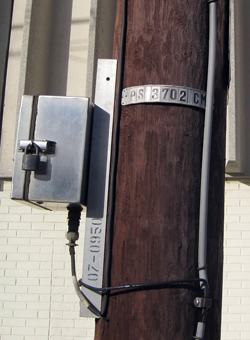 "Cobrahead" light and its pole number. Enter your User Name + Password and click on the orange ‘Log In’ button. Select your PSE&G account by clicking on it. Click on the orange ‘Submit’ button below your telephone number. The screen will return to the request you just submitted. 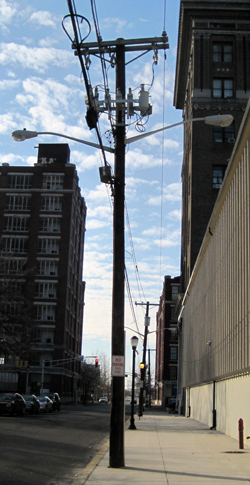 If you want to submit another request, click on "Report a Streetlight Out" near the bottom of the left column. This will clear the page and allow you to submit another request. Click on 'Log Out' near the upper right corner of the screen when you're finished. Click on the "Streetlight Out Form"
Click on Streetlight Out form on the window that pops up. Fill in the requested information. Note you only need to provide the information marked with the orange asterisks. Click on the orange 'Submit' at the bottom of the page. An acknowledgement page will appear.